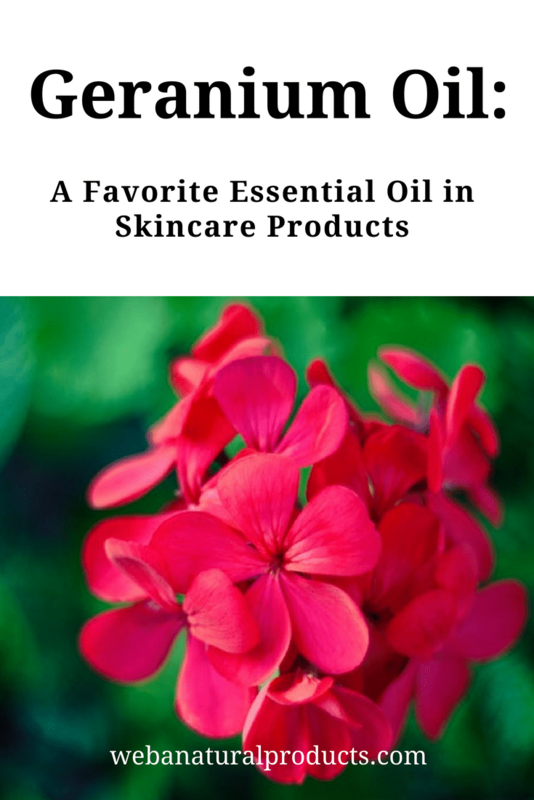 Geranium oil has been a favorite essential oil for the skin for thousands of years. There are may essential oils with beneficial properties for skin and hair. The oil of the Geranium plant, commonly grown throughout the eastern Mediterranean, is extracted via steam distillation of the leaves and stems. Its odor can range from lemony to more rose-like, depending on the plant’s age and the type of Geranium being distilled. There are as many as 400 different species of geranium, and its oil was used by the Egyptians to treat skin ailments and to boost mood. Geranium oil has numerous benefits. A few of them are highlighted below. Geranium oil combines well with most other essential oils for added benefits to skin and hair. A little goes a long way; just a few drops in a carrier oil are sufficient to impart skin-boosting benefits. The latest additions to our product line (Whole Earth Body Actives) take advantage of geranium oil’s balancing properties. They are the Facial Cleansing Oil and Makeup Remover and the Age-defying Vitamin C Face Creme. We firmly believe in the aromatherapeutic benefits of pure essential oils, and we use them in all of our products. If you would like to be introduced to this one, why not give our products a try?